"That scholarship got me involved," explains the third-generation pork producer. Brad's engagement in Davison County Pork Producers motivated him to become active in the S.D. Pork Producers Council (he served as president from 2005-2007), as well as the National Pork Board and the advocacy training program called Operation Main Street. After providing Brad with training on how to share his farm's story and how to put together presentations, Operation Main Street took the legwork out of advocacy by scheduling speaking engagements with local civic organizations, dietetic groups, county commissioners, and schools, as well as national and international sharing opportunities. "I spoke to a big anti-ag/anti-big ag group, and following my presentation a woman in the back stood up to say that after hearing me speak, she trusted me when I said that animal comfort is a priority for us and we take care of our pigs. Then she asked, 'How do I know that other farmers are doing the same thing?' This is why advocacy is so important." "Even though we're very busy, it's important for farmers to share with consumers how we are growing food and why we do what we do," explains Peggy, who makes time to post photos on Facebook and Twitter as well as serve as a spokeswoman with Soybean Council's Common Ground advocacy group. "Terms like 'factory farming' are put on farms like ours because of misperceptions. We need to dispel myths and remind consumers that 98 percent of all farms are still family-owned." Brad adds that even farmers and ranchers who don't feel they have the time or feel comfortable presenting, can do their part by making sure their neighbors and friends understand what they do on the farm. "Zoning issues come up because our neighbors simply don't know what is going on," Brad says. He adds, "Today there is such a disconnect among consumers as each generation is farther removed from the farm. 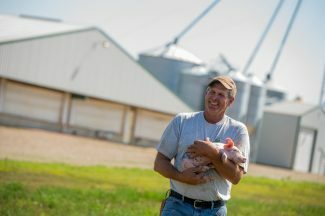 Even here in South Dakota – we drive 8 miles off the farm to Mitchell and there are plenty who don't know what we are doing here on the farm." Plenty is going on at the Greenway's farm. Today, Brad, Peggy and full-time employee, Thomas Smith, operate a wean-to-finish market swine and 220-head cow/calf operation. Although all financials are separate, Brad and Peggy share labor and equipment with Brad's dad, Tom, who at 83 continues to farm the land his parents, William and Elsie Greenway, settled after they emigrated from England to start a new life following the First World War. If you drive around the two farms, the evolution of the Greenway's hog operation becomes evident. A few portable hog shelters remain, as do the small farrowing houses and nursery, one of which now houses Tom's flock of chickens. At Brad's farm, four hoop barns are today repurposed as calving shelters. Their pigs are now raised in two state-of-the-art 2,400-pig wean-to-finish barns. "What kept us awake at night was how to keep our animals comfortable in South Dakota's extreme cold and heat," Brad explains. "Before we built these barns, we were at our max labor-wise, but not putting out enough numbers to be sustainable ­ the efficiencies just weren't there," Brad explains. "Today, all the work is automated, so we can spend our time taking care of the pigs. We love taking care of pigs." Timing also worked in the Greenway's favor. The new barns have allowed the Greenways to expand from selling 1,600 pigs a year to selling 10,000 pigs. "When I visit with consumers, I like to explain how many pigs I raise by the number of people I am able to feed. Each year, I'm able to provide pork for 40,000 people," Brad says. Brad and Peggy's pigs were reaching the finishing weight of 280 three to six weeks earlier than the pigs in the hoop barn, while eating less feed. The pigs shared the same genetics and were all from the same farrowing barn. "Basically, if we're to raise the same number of pigs that we raise today in hoop barns, we'd have to raise an additional 160 acres of corn and 90 more acres of soybeans to feed those pigs," Peggy explains. The labor it took to raise the additional pigs didn't increase. Brad, Peggy and Thomas are able to manage the workload of the diversified farm. In fact, Brad and Peggy, both 53, can leave the farm under Thomas' watch and enjoy some trips away. "Turns out we both had the same instructor," explains Thomas, a 2010 graduate who grew up on a family farm near Kimball. Brad graduated from Mitchell Technical Institute in 1984. "I tell my wife that farming is what I love. Working for the Greenways isn't a job. I enjoy what I do," Thomas explains. Over time, Thomas has had the opportunity to raise his own livestock. A percentage of the pigs in the Greenway's barns belong to him. He also owns some cows/calf pairs. Brad says he is happy to be able to help a young producer like Thomas remain active in production agriculture. "Let's face it, we are all getting older. Someone needs to transition. It is also exciting to have our son back in town and he is becoming more involved in the farm too." It was 1984 and Brad and Peggy were not able to get the financing they needed, so Brad's uncle purchased the farm with the plan that Brad and Peggy would then pay him back. Tom also helped the couple out, exchanging labor for machinery. "It is great to have the family right here," explains Tom. Brad and Peggy have two children, Brent and Mandi. Brent and his wife, Mollie, live in Mitchell where Brent works as a manufacturing engineer for Trail King and helps on the farm whenever possible. Mandi and her husband, Cris Bietz, and their daughter, Nora, 3, also live in Mitchell where Mandi works as a dermatologist for Avera. Sitting on a 4-wheeler he uses to get around the farm today, Tom explains that although he came of age on the farm during the Depression, lived through the challenging economy of the 80s and even today's current commodity prices, his life as a farmer has been a good one. "I love farming. It's been good to me. I am going to keep doing it as long as I can," he says. "I just love mechanical work and hate to see the old machinery going into the iron pile and down to the junk yard and scrapped out. This is never going to be made again, so I'm doing what I can to keep this old machinery around." To learn more about the Greenway family and view a video as well as an online photo gallery, visit http://www.sdfu.org.